Awesome Toast! | Configure TP-LINK Archer C9 (or C7, C8) for access point mode Configure TP-LINK Archer C9 (or C7, C8) for access point mode – Awesome Toast! Thank you! If only I had read this an hour ago…there would have been much less yelling. I do this and it works as an access point, but I cannot back into it with the new IP address. I have to disconnect the router from the rest of the network and plug it directly into my laptop Ethernet port and do a hard reset and start over. I can re-input the settings above, reboot, retest, etc and have access to the Archer. As soon as I plug it into the rest of the network (not using the WAN port), I can no longer access the Archer at the new static IP address. Even unplugging it from the network will not let me back in. Not sure how to determine if I have a bad router. Wifi works great no problem. Wired devices have no internet. device can actually be connected through the new static ip-adres. So it is only a solution as a wifi acces point. Is there a solution on how to make it a kind of extender for my excisting router provided by my isp, for the use for wired and wifi? i had the same problem, but just because i did a small mistake. i used the same static IP which is shown in this how-to, not realising, that my router uses: 192.168.1.1 instead of 192.168.0.1.
just a hard reset (button on the backside of the archer!) set back all to factory-settings and i had to reconfigure my c7. so maybe ur ip-range of your other router is not the same as shown here. 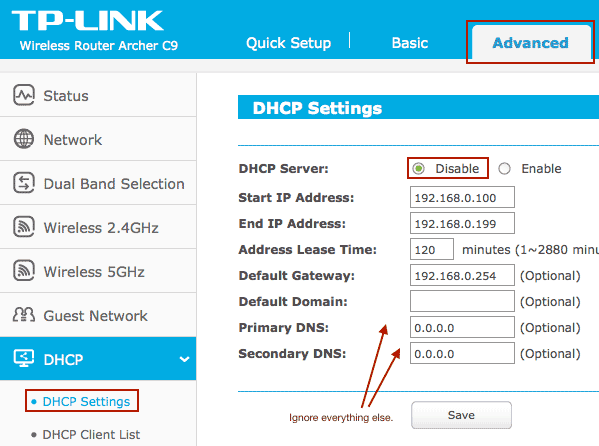 When I disable DHCP-Server I can no longer access internet through WiFi. Disables ability to connect to it. I can see my networks name on both my iPhone and my laptop but cannot log on to it. +1 #3 Dave. Much less yelling if I’d have read this first…. Thank you, very straightforward and simple. Do you have further instructions for using a 2nd router as a range extender when you cannot connect to the base router via ethernet cable? I want to put the 2nd router at the edge of the first router’s “good” range to extend the reach. I can’t run an ethernet cable to my 2nd router (the C9). I have a C7 and I cannot get to see the Advanced setup tab shown in your example. Followed the instructions and while my network connections worked, my internet connection for wired was down. Reset router, tried again, same thing. Reset router again and tried again… same thing. FINALLY I TURNED THE POWER SWITCH OFF, left off for 10 sec. and turned back on. EVERYTHING NOW WORKS!!! Has anyone been able to use this as a wifi repeater? I have a Archer C3150 (similar interface to this), and want to connect this router *via wifi* to a Verizon Jetpack, so it will blast the hostpot signal everywhere. Wifi repeater/range extender should be out of the box for something I paid almost $250 for….. Any help would be much appreciated! Thank you. This is wonderful information that was much easier to follow than what I was trying to read and follow on the TP-Link website. My Archer C7 modem is now functioning in bridge mode just as I wanted to. Only 1 should be used as a repeater. works like a charm…except I can’t reach the admin page of the router any more… any ideas ?? Worked like a charm, thanks a lot!! I still have one weird problem. If I plug in my laptop’s ethernet connection to an Archer C3150 LAN port, then run “ipconfig /all” in a command window on my laptop, it shows TWO gateways configured: 192.168.1.2 and 192.168.1.1. The 1.2 one is the Archer C3150. The 1.1 is for my wired router — and it is the ONLY one that I really want. With the 1.2 one coming first in the Gateway ordering, it simply does not work! I cannot use my laptop to open the Archer’s admin console at http://192.168.1.2 even though I’m connected directly to it! Frustrating. But if I connect my laptop via one of the Archer’s wifi points (2.4G or 5G), then the “ipoconfig /all” shows only the wanted 1.1 Gateway — and everything works fine. I can connect to the http://192.168.1.2 Archer admin console, and everything else too. Also, I’m using two of the remaining 3 LAN ports on the back of the Archer for my Yamaha receiver connection, and for one of my NAS connections. And they properly see only the 192.168.1.1 gateway, and work perfectly fine. It’s strange that only my laptop (running Win7) is getting the 192.168.1.2 gateway when directly connected. Well, I can live with this. Unfortunately it means that whenever I have to do a firmware upgrade on the Archer, I’ll have to do it wirelessly. But I did one just now (to bring it right up to date) and it worked fine. Oh, one final thing. When I configured my NTP server on my Archer, I found that I had to explicitly create a static route for it. I’m using time-b.nist.gov. Actually, using its IP address (129.6.15.29). Without a static route, the “GET GMT” button fails. Adding a static route (for 129.6.15.29, subnet 255.255.255.255, gateway 192.168.1.1) gets it working. This shows that the router itself doesn’t really know how to get “out to the internet” through the wired router. But other devices connecting THROUGH the router somehow get the proper gateway of 192.168.1.1 assigned — without requiring an explicit gateway setup on the router’s LAN. OK, that was a very long-winded comment. We now return you to your regular programming…. Thanks for the tip! I was able to stumble into this after a few hours of experimenting. Everything is working now, except I am no longer able to access the Archer’s Admin screen. It’s simply inaccessible via wireless or wired. Any idea why that’s happening? Thanks! These are the steps I’m accustom to, but really helpful to quickly find where all the settings are at. So glad it lets you set your own subnet when setting the static IP. Some routers don’t let you do that, which fucks everything up on my non-standard subnet network. You are awesome! What an great, simple guide. I was going crazy trying to decipher the official documentation. This helped, though I feel like it shouldn’t even have to exist. Previous models from TP-Link let you set the mode to access point in no uncertain terms – it is simply a drop-down option. I also found that I couldn’t use time servers without adding a static route. This is not ideal, as the entire point of DNS is that you don’t have to worry about IP addresses changing. It probably helps with load balancing too, and by going directly for the IP address we are not being good stewards of free services. Luckily, unlike this guide and another one I found, disabling DHCP was not required. I prefer to have a few DHCP servers on our network. No need to send traffic back through the switches from clients running through DORA. This is a pretty weaksauce method provided by TP-Link. Their stuff isn’t too bad. This is amateur hour, however. Thanks for the guide, didn’t work for me though; well, it kind of did. I have a C7, so slightly different, but basically the same animal. I’ve followed the guide, and do have a wireless connection from the router, both 2.4 & 5GHz. So, the network itself is working, but something’s seriously throttling it; I’m currently seeing a DL speed of just 1.09Mbps, instead of 113.02Mbps which it should be (so I’m losing 99% of my speed!). I’ve tried disabling each frequency, and have run a speed test on each independently, with the same result. I’ve just power cycled the C7, and although I can still access the network (same low speed), I’m now no longer able to access the login page as others have experienced! Any ideas floating around out there?! Okay! After a little experimenting, I’ve gotten something to work! I’m trying to connect my Archer C9 to a modem/wifi router from Comcast (a Technicolor CGM4140COM v2.2, for reference). What I wanted was for the internet to come in through the Technicolor and broadcast an SSID from there. I also wanted my C9 to broadcast a separate SSID for stationary devices on the other side of the house from where the cable comes in. I ran into the same problems described above, it would “work” for wireless connections, but there was no way back into the C9’s config page after I connected it to the Technicolor. The problem, I think, came from their IP address ranges. The C9 defaults to 192.168.0.1, which this guide changed to 192.168.0.254. My Technicolor defaults to 10.0.0.1. So, 192.168.0. * doesn’t appear in its DHCP range. Instead, I configured my Technicolor to stop assigning addresses at 10.0.0.245 (down from its default of 253). Then, I set my C9’s static IP to 10.0.0.246, left its internal DHCP server on, and gave it the range from 247 to 253 (with 253 being the original cutoff from the Comcast modem). Now! Everything works, wired or wireless, and from either SSID I can access the TP-Link C9 from the static IP that I assigned to it. Which I believe works because they’re now both on the same range. I don’t play with things like this very often, and this is the solution that worked for me. Hopefully I’ve explained it well enough, and maybe it’ll help somebody else. I have an Archer C2300 V1 that is now my new router and decided to turn my Archer C7 into an AP. I have followed the instructions but I am having some issues and tech support could not help either, they said they would email me back after talking with a “higher tier tech support rep”. It has been days and now word from them yet. I have an Arris Surfboard 6190 that I use with Comcast. It feeds the C2300 the IP is 192.168.0.1 On the C7 I set the IP on the lan to 192.168.0.254 and disabled the DHCP. I can connect to both of the user interfaces and I can connect via the tether app on both units but the problem is the C7 only works on the local network it is not able to connect to the internet. Any ideas on why this would be a problem?